This Automotive Artist specialises in the Formula One marketplace and based in the East of England, produces images portraying real action, the passion, and excitement, many, of which feature the best known racing drivers and their famous car brands. Giclée prints these works onto high gloss canvas to support the bright colours, varnishes, stretchers, and packs the products. They are sold into 35 countries including the UK. 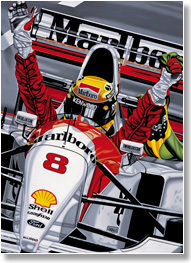 Private collectors include – George Lucas, Emersan Fittipaldi and the Ayrton Senna Foundation.